Feeling... Overwhelmed. I don't even know what has been going on this week but I'm exhausted. I'm glad it's Thursday, but at the same time, I can't believe it isn't Friday yet. Reading... 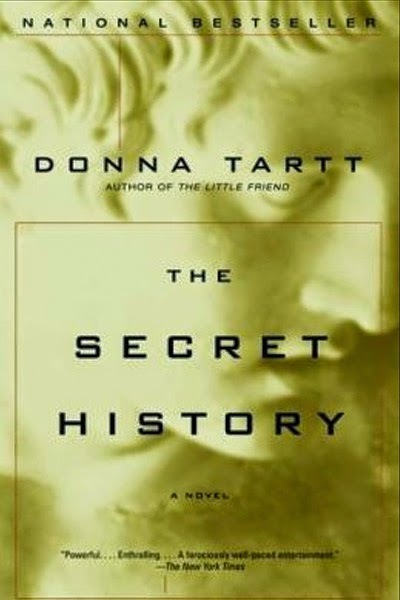 The Secret History by Donna Tartt. I'm taking a break from the Philippa Gregory series mostly because I finished the last one on Sunday night and didn't have the next book in the series yet and needed something for my morning commute. The Secret History is interesting so far. I'm about 100 pages in. Watching... Nothing. I haven't turned on my TV once this week. It's been that kind of week. Anticipating... My mom coming to visit for Thanksgiving! I'm excited for a short work week and a nice, long relaxing weekend in DC. Disappointed about... the fact that I haven't run all week. It's been, as I said, an overwhelming week. Working on... cleaning/packing...I haven't really started packing, but I'm going through the 'purging' stage of moving. Loving... The Kitchn. It's my new favorite website. I'm hooked. Weirdly this week has been excruciatingly slow for me too! Or, well, I can't believe it's Friday either. Exhaustion maybe tied to the weather? Next weekend though...ooooh next weekend.. I feel you on this week--it has been NON-STOP!!! Hope things slow down for you this weekend so you can catch a break and get more done with the purging and packing!! Sounds like a very interesting book, let me know what you think about it. I haven't run much this week either, it's been freezing though. Hope you get some rest this weekend! The Secret History looks so interesting - let me know how you like it! The only good thing about moving is you clean up your stuff. Isn't it unbelievable how much you collect in just a few years? This week has been so draining. I'm so happy next week is a short week!! !